The combination of chemotherapy and radiotherapy could not only enhances cancer treatment efficacy, but also shortens the period of the overall treatment and relieves the negative emotions of the patients during the remedy. 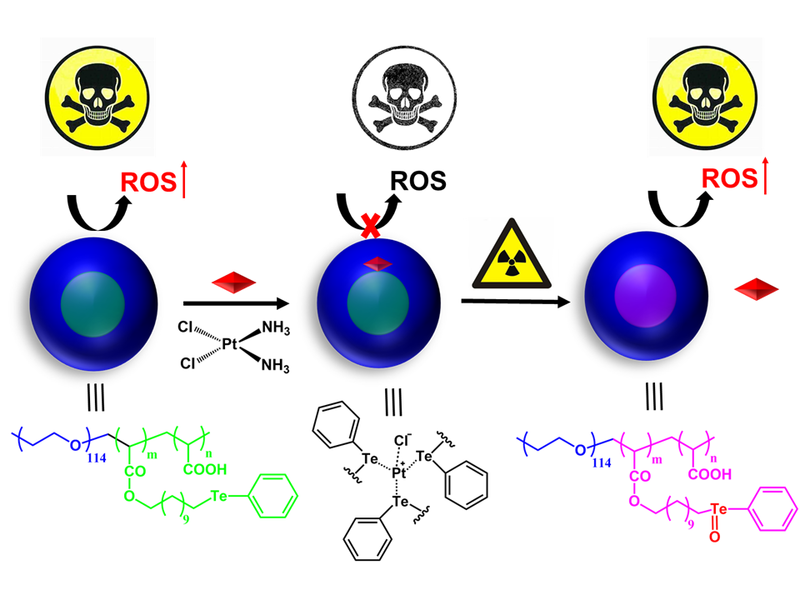 Here, we presented a novel strategy for coordinating the chemotherapy drug CDDP with a tellurium-containing polymer, which restrained the tumour cytotoxicity of these two portions. After low dose γ-radiation, CDDP departed from the coordination complexes, and the tumour cytotoxicity of both was restored. In contrast to conventional chemotherapy, this radiation responsive system possessed specific anticancer effects and less toxicity in the non-radiation region. In addition, with regard to the premise of therapeutic efficiency, this system effectively lowered the radiated dosage.